The Whooper Swan ( Cygnus cygnus ) is a large Northern Hemisphere swan. It is the Eurasian counterpart of the North American Trumpeter Swan. 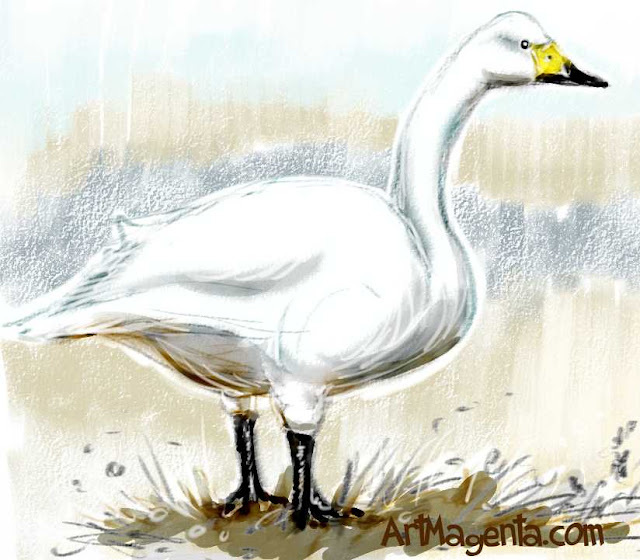 TAGS: Bird painting of Whooper Swan, bird sketch of Whooper Swan, bird drawing of Whooper Swan, bird art of Whooper Swan, bird illustration of Whooper Swan. The Tundra Swan (Cygnus columbianus) breeds on the Eurasian tundra from the Kola Peninsula to the estuary of river Kolyma in eastern Siberia. The Black Swan's (Cygnus atratus) original habitat is Australia and its associated islands. Since the mid-1800s, the black swan is also in New Zealand. In Europe, some specimens escaped from their enclosures and now breeds in the wild. The Mute swan (Cygnus olor) is found in Europe and temperate Asia as far east as China. Mute Swan was introduced to several areas around the world, including North America and Australia.